Old map by BRITISH ADMIRALTY CHART. - Africa east coast Pangani to Ras Kimbiji including the approaches to Zanzibar… Surveyed by commander W. J. L. Wharton. . . 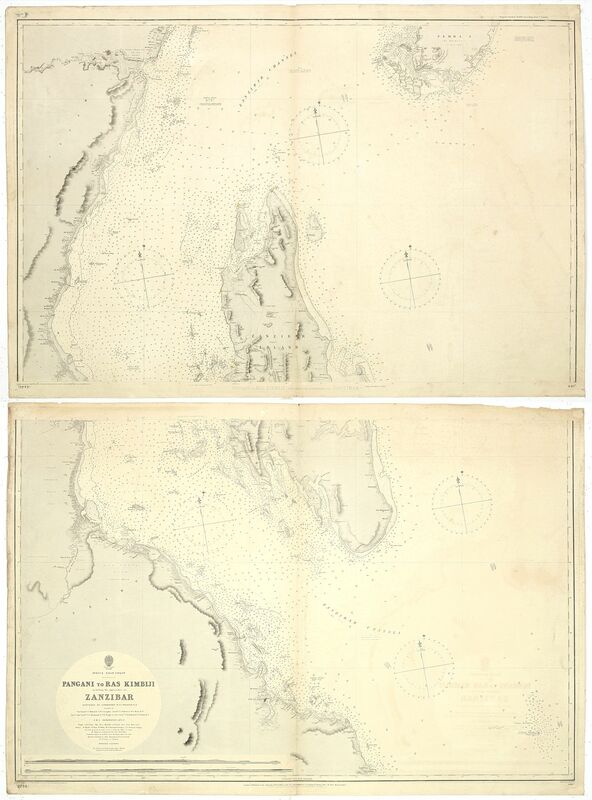 Title: Africa east coast Pangani to Ras Kimbiji including the approaches to Zanzibar… Surveyed by commander W. J. L. Wharton. . . Size: 25.2 x 38.6 inches. Condition: Two sheets, if joined : 1280 x 1960 mm. Paper slightly age-toned as usual. A few tears along margins. A fine Hydrographic Office chart no. 640a and 640b of the coast with Dar es Salaam and the Island of Zanzibar. Engraved by Edw.d Weller. London : Published at the Admiralty 30 th. Jan.y 1875 under the Superintendence of Captn. F. J. Evans, R.N. Hydrographer : Sold by J.D. Potter agent for the Admiralty charts, 31 Poultry & 11 King Street, Tower Hill". Full title : "Africa east coast Pangani to Ras Kimbiji including the approaches to Zanzibar… Surveyed by commander W. J. L. Wharton. Magnetic variation in 1885, decreasing about 2' annually".